We help good people with unique challenges achieve their real estate goals by getting them connected with private and alternative financing. To put it simply, We make loans happen, even when no one else can. It's more than you asked for, no less than you deserve. We thrive on creating wealth and security for our clients as well as the community, by empowering our investors and borrowers to achieve their highest goals. A family-run, private lending company. We make loans easy. We make loans happen. It’s more than lending, we help people achieve a better tomorrow. We propel investors to new heights, with yields between 8.95% and 10.95%. It’s investing made valuable, predictable and personal. Want to Grow? Join me March 14th!! 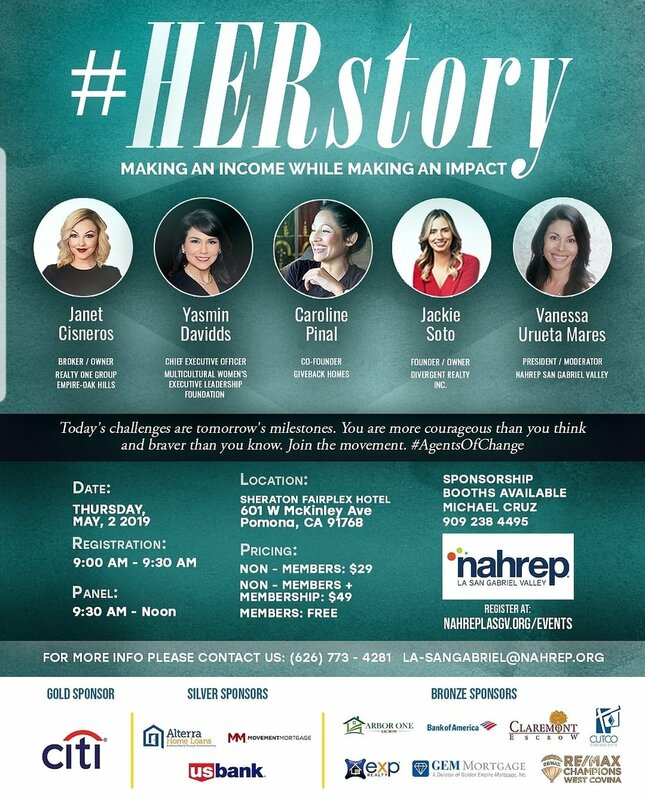 NAHREP LA San Gabriel Valley Event. Real Estate, Build Your Future. Our Partners tend to forget that we also service Commercial transactions! Conventional Lenders tend to only loan on properties with the loan amount minimums of 1 million and above. Here is a key issue to keep an eye out for your commercial clients. Frank Williams is Co-Founder and Divisional Manager of Capital Direct Funding Inc. in West Covina, Calif.,and President of the Los Angeles Metro Chapter of the California Association of Mortgage Professionals (CAMP). National Mortgage Professional Magazine recently spoke with Williams regarding his work with CAMP and his local Chapter. Issues with Closing? Capital Direct Funding Can Help! Unexpected delays in acquiring your investment is always disheartening. Here are a few common problems that arise during the loan process for either a Residential or Commercial property. In 2017 Capital Direct Funding began the Easter Blessings Campaign. This thoughtful project came about through Frank Williams, Divisional Manager of CDF. Frank holds a dear childhood memory of his mother receiving a dinner from their church one Easter Sunday. Being a lower income family this held a significant appreciation and gratitude from him and his family. Even though this practice is most common during Christmas and New Year’s we understand how important Easter is to many of us and we believe it should be commemorated equally. “Where we put our time reflects our deepest values” states Sandra Williams, Co-founder and President of Capital Direct Funding. The key to balancing your life, your career, family, relationships, and self-care is dependent on self-discipline. Although incorporating physical training into her busy schedule was challenging at first, she was convinced she wanted it, and so she went for it! With some inspiration from her colleagues, who make time to workout despite their plentiful responsibilities, she was prompted to take on a new challenge. A year ago I was asked to serve as the Los Angeles Chair of an organization called THE 200 led by Joe Coto former California State Assemblyman and John Gamboa President of California Community Builders and former director of The Greenlining Institute . As an advocate of sustainable Homeownership for more than 25 years, I am a firm believer in creating wealth through Homeownership, and building an intergenerational legacy. A year ago I was given the opportunity to embark on an incredible journey to grow my education in a way I had thought unimaginable. Due to my active community involvement, I was introduced to Dr. Yasmin Davidds, CEO and Founder of the USC Latina Global Executive Leadership Program. Did you know we can help your clients with tax issues still accomplish their real estate goals? We understand the myriad of challenges your clients face when dealing with complex tax issues. We our experts at finding solutions to accommodate your clients needs. Door-knocking is a great prospecting activity to increase your clients. Through this process cultivating, key pre-screening questions is important. You might meet customers who lack essential qualifications to purchase a property. MAKING AN INCOME WHILE MAKING A IMPACT. As true Agents of Change, Sandra works side by side with Angel Virgen, a Representative of Skyline Security 10X. They both showcase the Values what NAHREP San Gabriel Valley Chapter has to offer. On May 2nd, there will be several Elite Panelists speaking on opportunities they obtained with strategic viewpoints and will share their knowledge to give you a edge on the Future of Real Estate! Give a Kid a Chance to Shine! "Our mission for our first annual Easter Blessings Event is to give back by providing an Easter dinner for families in need. We want to provide them with the same experience we had growing up." 24 Families received our Easter Dinner! Capital Direct Funding wants to encourage everyone to go out and VOTE!! Bring you Stub or I Voted Sticker and you will get UNLIMITED tacos! the Giving Back Destination Project. Capital Direct Funding would like to take this opportunity to recognize and support Peter Mendez for his help with the Giving Back Destination Project.